The bug fixes and details on future releases of xLobby V3 will now appear in the mantis change log. I will still mention relevant bug fixes and new features and items that need specific details explained. A few new features have been added to the Event Editor. 1. Command Count to indicate how many commands are in a single event. 2. Copy, Copy All button so that individual or group commands in the event editor can be copied and reused in another event. 3. Delete All button to delete a long event without having to delete them individually. 4. Paste button for the Copy All feature. 5. Clear Buffer, clears the Copy All items. 6. Under the Toolbox Menu is a new function to Lock and Unlock all the graffic elements in a menu so they can not be moved while adding events to elements in the skin. Also live video streams, example: http://sv08msmedia.dot.ca.gov/D7Cam4. 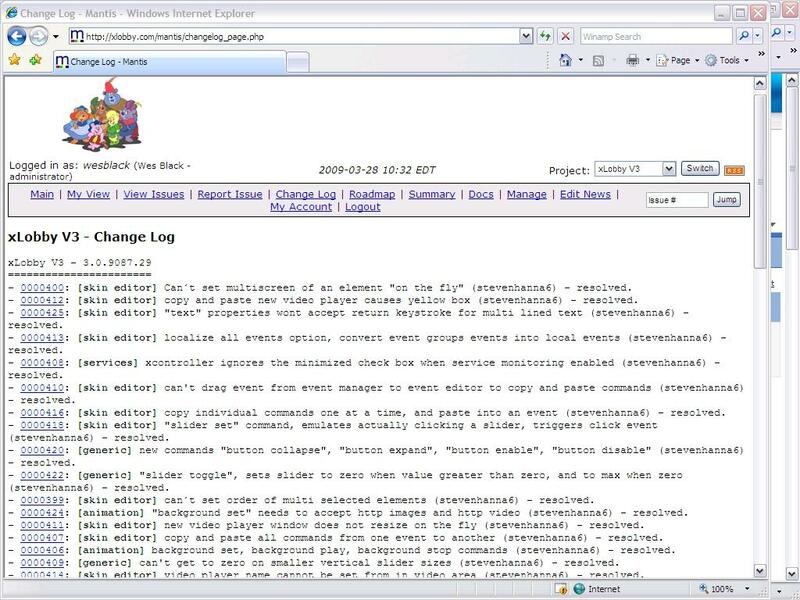 see Event Editor Screen Shot 3. Upcoming additional features will include Repeat, Random commands, ability to load images from the picture library. 8. 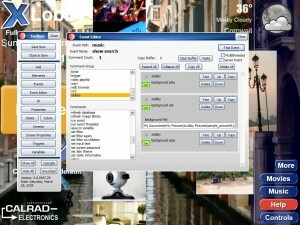 Background Play and Stop commands for video backgrounds. This News Post is Subject to changes. 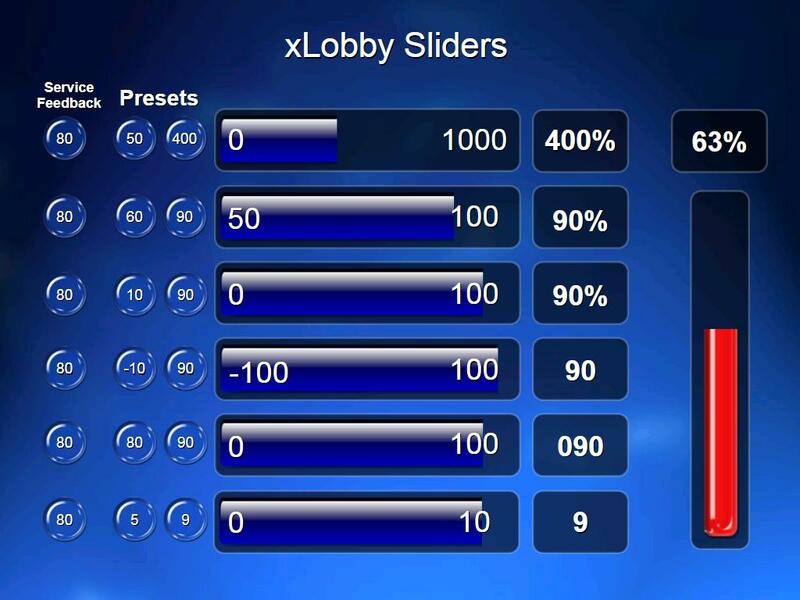 The next release of xLobby will include a sample menu that demonstrates the new Slider controls that are used with the new xLobby xController-Uconnect RS232 service to provide real 2 way interaction and numeric feedback between Stereo Receivers for volume controls, Lighting Dimmers, Sleep timer, Visual Security exit timer or any other control element that uses slider control elements. Other uses include visual timer events, opening and closing graphic elements based on x,y positions or to create some cool visual button or graffic element effects that can change size or location. Settings include 1. Set Min to Max values, 2. Tick Frequency, 3. Number Format. The new service is located in the root directory of xLobby under the folder called Services. 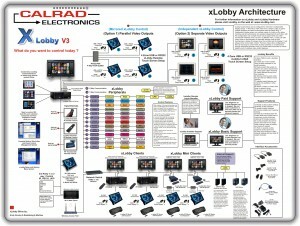 Calrads new 92-161 In-wall IR distribution system is perfect for expanding IR control to multiple devices. 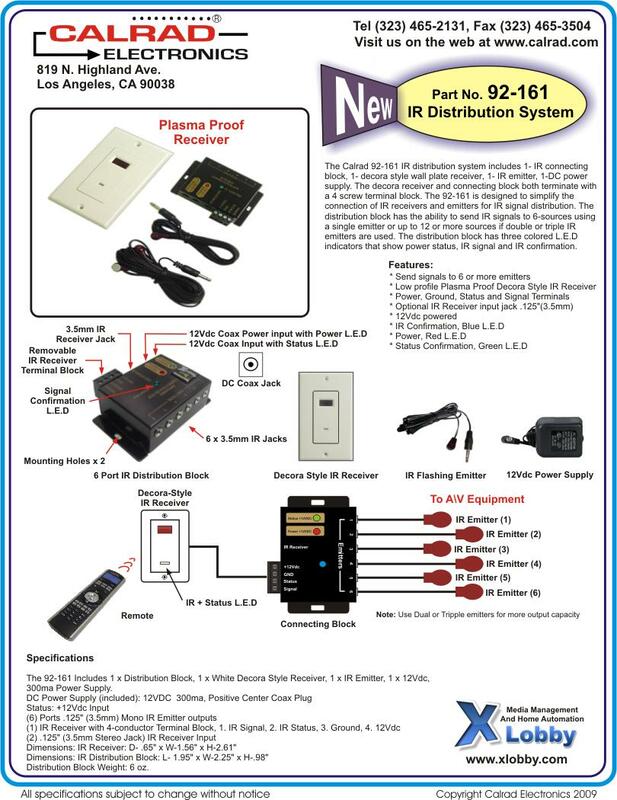 Everything you need for a basic IR distribution system. The 92-161 is ideal for home theaters or media rooms where all equipment is hidden away in a rack or cabinet but requires control from an IR remote in the room. 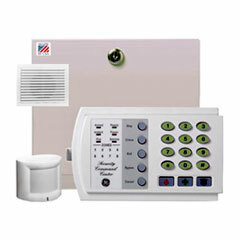 Includes (1) In wall designer style receiver with IR signal and status L.E.D. 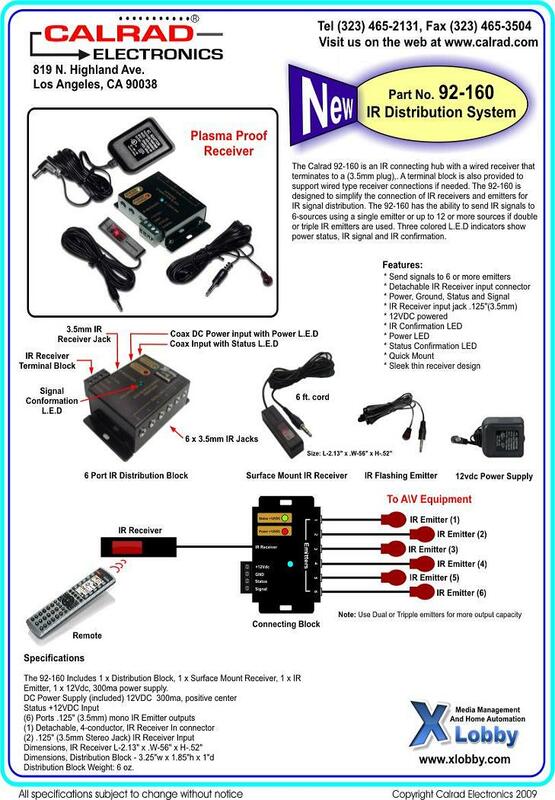 indicator, (1) IR Emitter, (1) Amplified IR Distribution Block, (1) PS2 12VDC/200mA Power Supply. 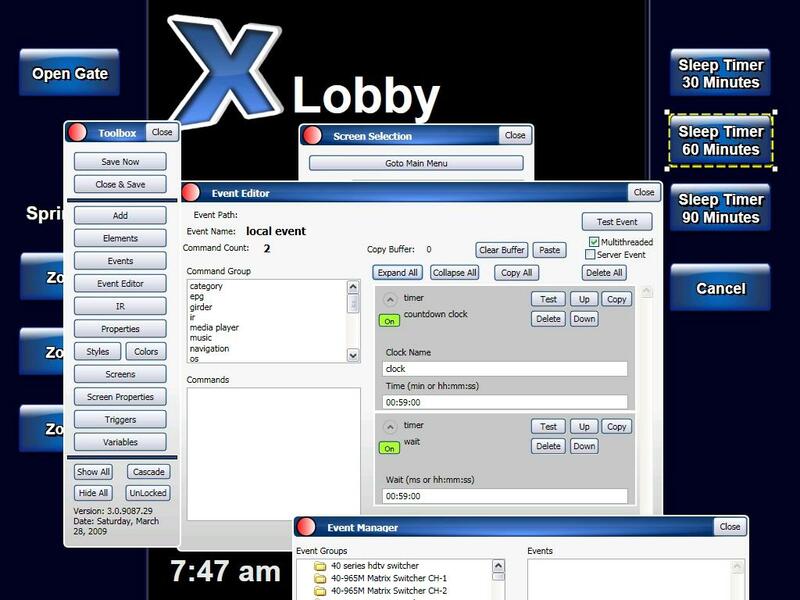 Works with all xLobby Servers, Clients and xLobby Mini Clients. Marbles has officially released Zoneskin5. Please copy the appropriate files to their respected directories, and please read the included manual to aid in getting the skin running. As well, I’ve included my KX DSP setups, and Girder .gml file. If you have any other questions, please ask here, or send me an email. Nice job, thanks for your ongoing support ! 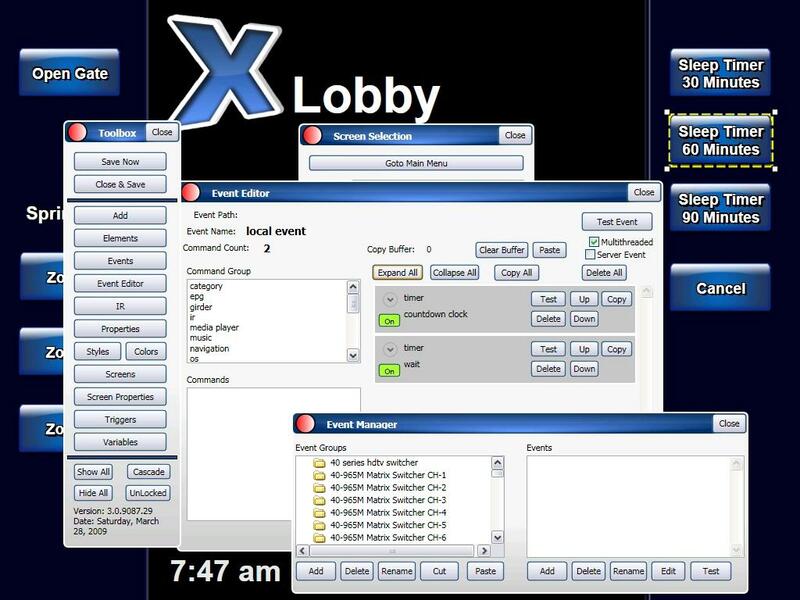 We receive many requests for xLobbys structure and how to do multiple machines and how do we control devices connected to xLobby. 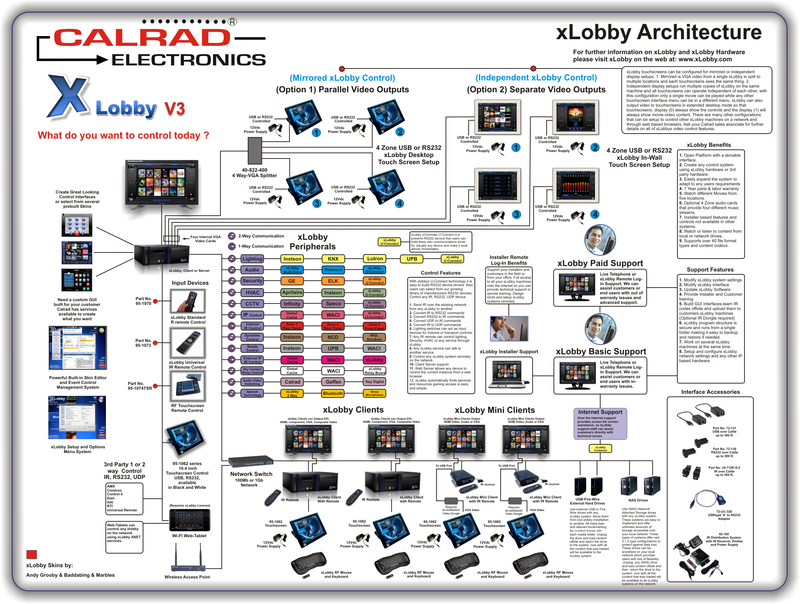 So I created this simple xLobby Architecture diagram that shows the basic concepts for xLobby to communicate with xLobby systems and the type of products that can be controlled using xLobbys powerful new backend with all the new services. The diagram was getting quite large as I built it out, I wanted to add more but thought the complexity was already difficult to follow. So future diagrams will show more of the hardware relationship work flow versus a mixed diagram of hardware and block elements as shown. I am creating more diagrams as time permits so users can visualize how xLobby can do some very interesting tasks and to further outline some of the more basic features and concepts of the interface. 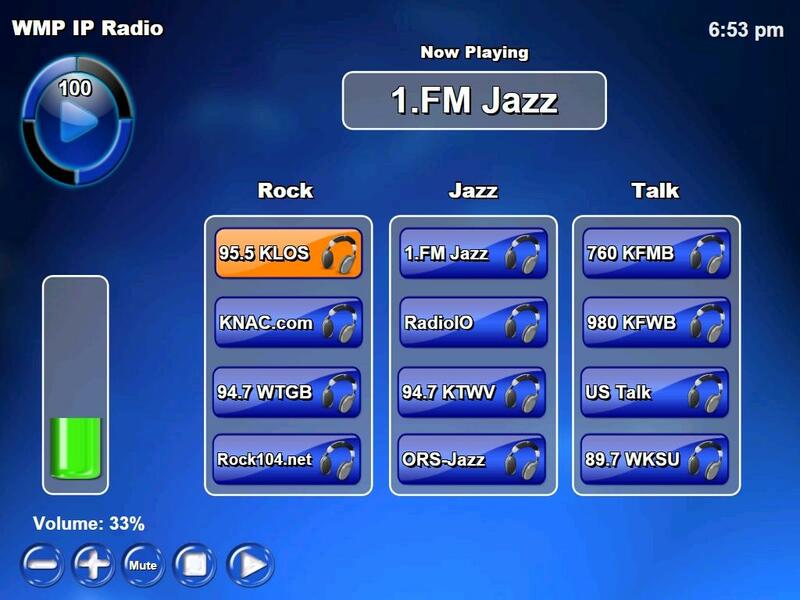 The next release of V3 will include a new sample menu of playing back IP radio using the windows media player (WMP) engine. 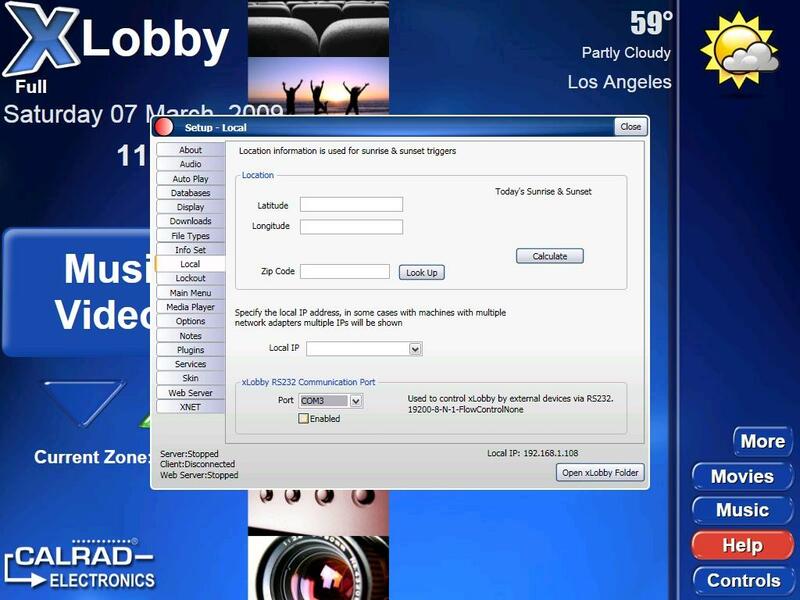 This provides users with additional options for playing online content using (WMP) so that any extension (WMP) can play xLobby will be able to play as well. 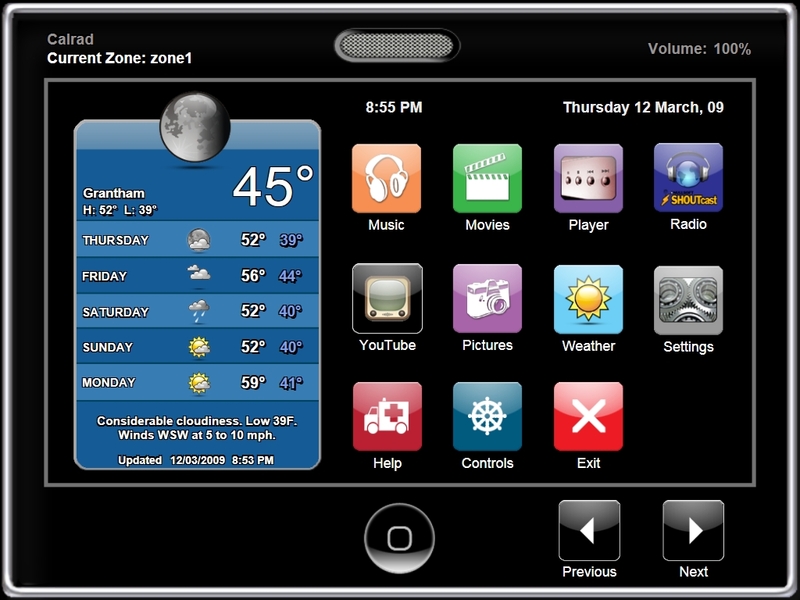 This feature will only play back using the default audio zone and will not work for xlobby multizone at present. This new player will also allow us to exploit the visualization feature as well as other items of (WMP) which will be announced soon. Also the content will stop playing if you leave the menu. 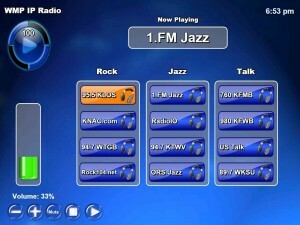 This will not replace the existing IP radio menus but will add more flexability to xLobby for streaming online content. More robust control over the player will be available soon. 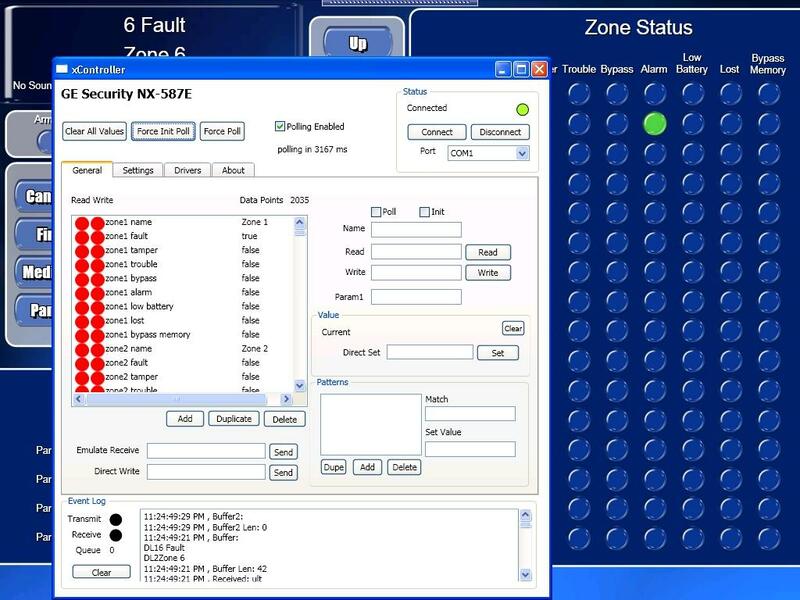 xLobby realtime interface for GE security systems. Accessable to any xLobby system connected to the service from the network. 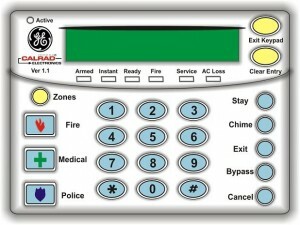 Works like any GE stand alone keypad. Status icons can be programed to be solid, flashing indicators or even a animated fade in \ out effect. Create a simple user interface or exploit all features to show any detailed information you want. All security events can be used alone or in combination with any xLobby system wide events. 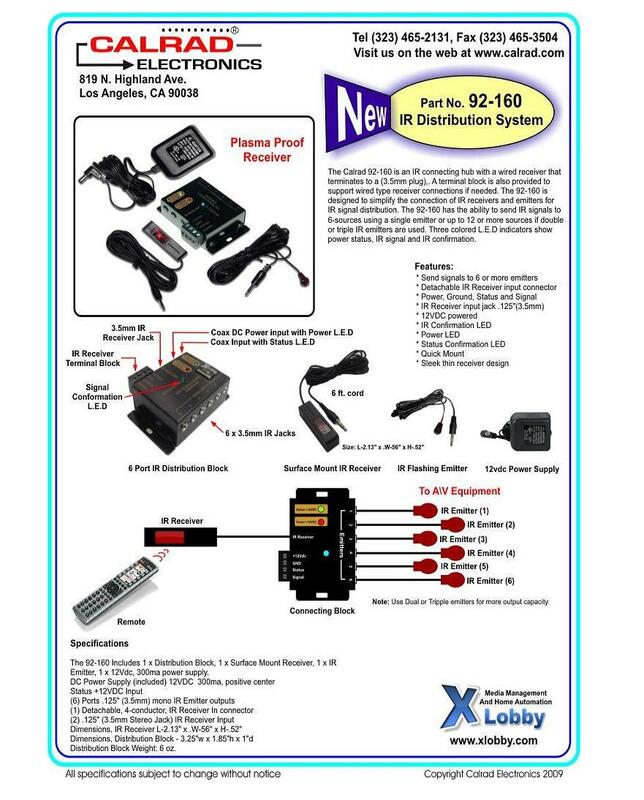 The current xLobby release has all the new services included for Lighting, Russound and the powerfull new xLobby U-Connect RS232 service. More specific details on features and how to use the services will be posted soon. NX-587E Serial Interface Module used to communicate with GE security panels and standard 9 pin RS232 ports. 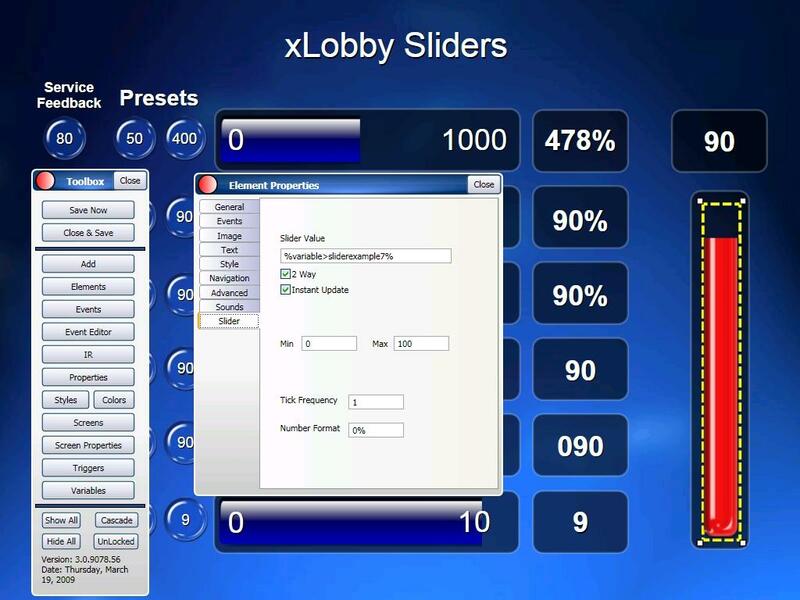 Andy is working on a new xLobby skin, see the link below. This new release contains several bug fixes and several enhacements which I will update over the next few days when I get a completed list together. 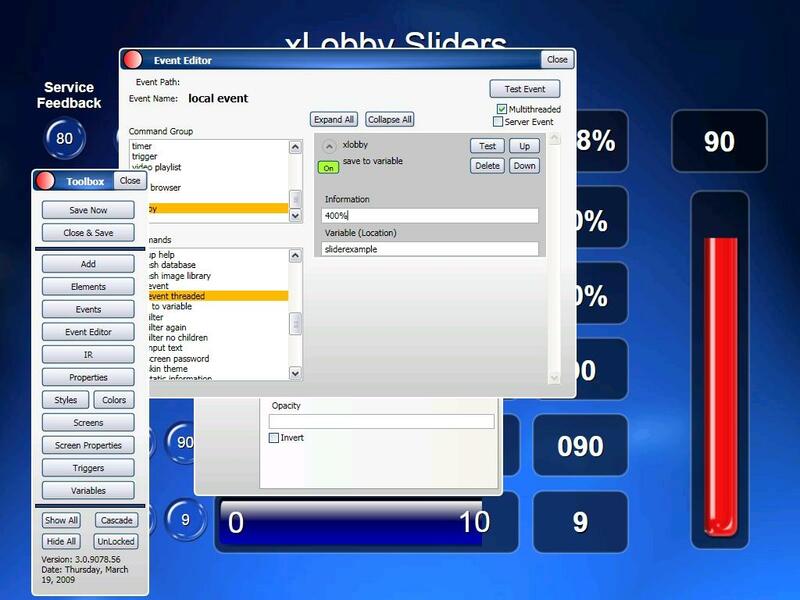 The ability to control xLobby via RS232 2 way has now been added to the triggers section and users can now add there own RS232 triggers. 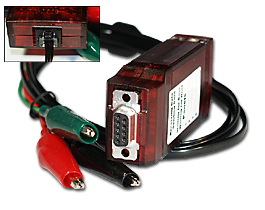 If you test this between two xLobby machines from one serial port to another, use a Null modem serial interface cable. This new exposure will allow 3rd party companies like (Crestron, AMX, Control 4, RTI, etc.) 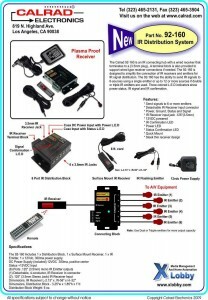 to control xLobby using the RS232 protocol and get 2 way feedback. 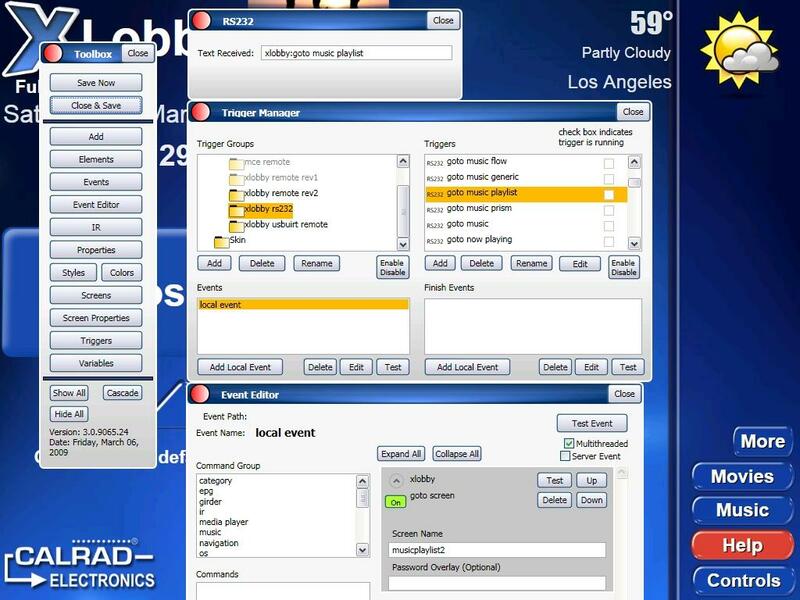 Under the skin editor you can build and add your own RS232 triggers providing access to control any event in xLobby. 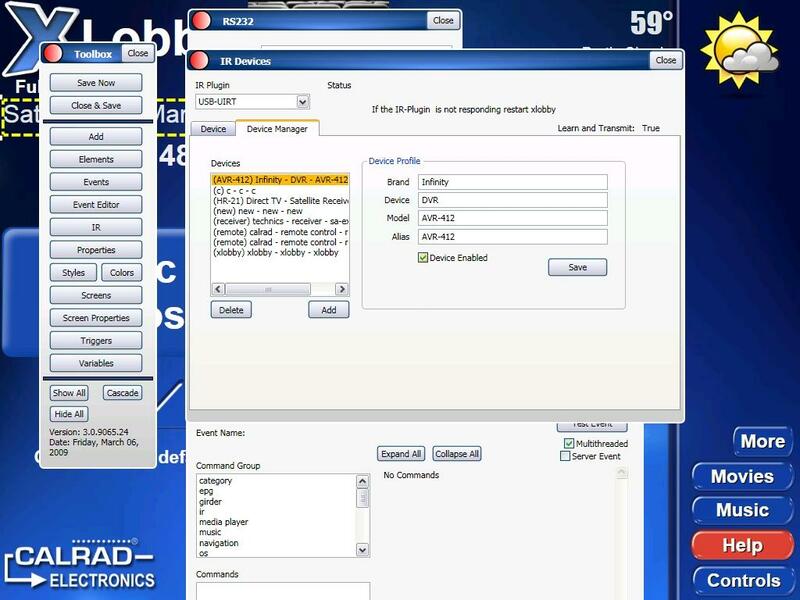 Calrads new IR distribution system is perfect for expanding IR control to multiple devices. Everything you need for a basic IR distribution system. The 92-160 is ideal for home theaters or media rooms where all equipment is hidden away in a rack or cabinet but requires control from an IR remote in the room. 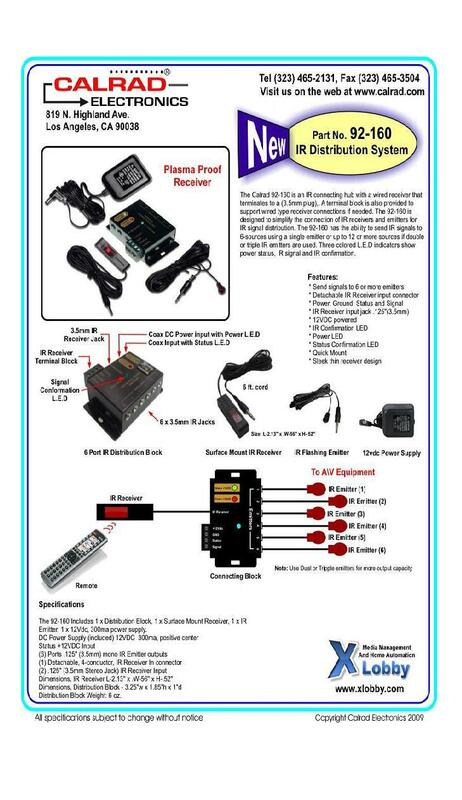 Includes (1) Miniature IR Receiver, (1) IR Emitter, (1) Amplified IR Distribution Block, (1) PS2 12VDC/200mA Power Supply. 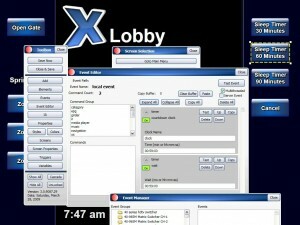 Works with all xLobby Servers, Clients and xLobby Mini Clients. 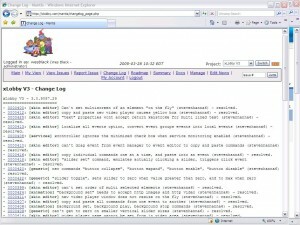 You are currently browsing the xlobby news blog archives for March, 2009.